So many times in real world you will come across ‘Database replication Issues’. Replication Issues are also very much possible during your CCIE lab so one must be prepare to deal with such Issues. RTMT (Real-time monitoring Tool) is a very useful tool for not only checking replication Issues but for lot of other stuff. I will discuss RTMT in detail in some other section. To find out replication status using RTMT, you will need to click the ‘Call manager’ tab on bottom left and then double click ‘Database Summary’. You will get the following stats for a healthy replication. As long as ‘replication status’ shows same number across the cluster – that means replication is good. If it’s not same then that means replication is not good and you better take some action really fast! This command reads and writes database information from all machines and will take quite some time…please be patient. (1) Number of rows in a table do not match on all nodes. If Sub is your Primary Call manager for Phone registration then due to replication Issues phones will not register to Sub and will keep on looping with an error on screen ‘DB-Error – Registration Rejected’. This is what I came across as the most simplest solution out of many. nodename = which node to repair replication on. all = fix replication on all nodes. Give it sometime to repair and when it is done then restart all services at Subscriber and Put it back in CUCM group. If the replication issue has been resolved you will see phones quickly getting registered back to Sub from Pub. You can then run the same replication checks as described at the start of this post for verification. 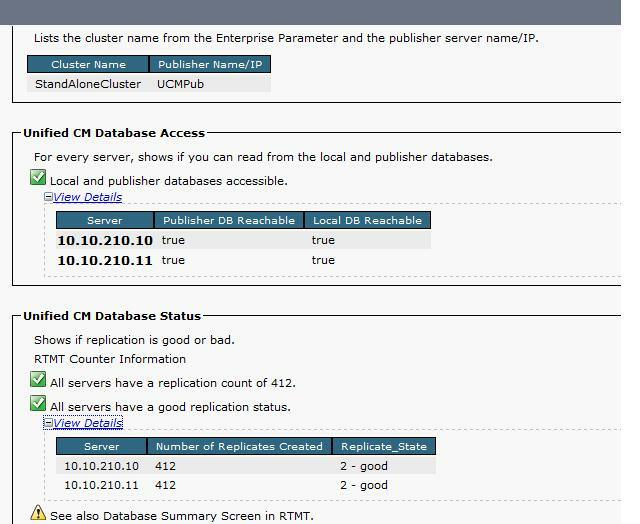 I have N/A replication state on the Cisco Unified Reporting and a 2 replication status on the CLI. Any ideas on this? Check the connectivity between all your servers by running “utils diagnose test” and “show tech dbstateinfo”. Also check replication status from RTMT.